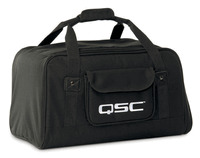 QSC K12 Tote Soft Bag K12 DJ Tote Bag DJParts - All Variety of Parts that DJ Needs. Soft, padded tote made with weather resistant, heavy-duty Nylon/Cordura® material for K12. Side-flap access to K12 aluminum top handle for vertical carry.